Previous Post : Is Instagram Slowly Becoming The Next Major E-commerce Marketplace? Top tips to take your Facebook ads to next level. Facebook is one of the most popular online advertising tools in the world, helping businesses find and connect with relevant audiences. It’s also quite happy to swallow as much money as you can throw at it, so it’s important to make sure your budget is invested right to get results! Learn how to target your campaigns more effectively below with two quick tricks. Please note this tool isn’t available to members of the general public. You’ll need to have an Ad Account set up to access this feature: click here for more details. Fine-tune your content strategy like never before. Audience Insights is a free tool Facebook offers advertisers, allowing them to see what kinds of things their existing customers want (and find new people that might be interested in their products in future). Tap into Facebook’s rich database to look at users in your suburb, city, country, or all over the world! Find out which pages they like best, what kinds of services they’re buying… This can be a great tool to find which Facebook Pages in your industry are most popular with your target demographic, then position your content strategy to match. How does this work? Through filters, lots and lots of them. You can find people by city, age, gender, job, relationship status, education level… You can even look at what people who interact with your page like (and use this to drive smart content decisions in future). So how do we make this data work for you? Imagine you’re a retail company that sells a wide range of products at different price points. You’re about to launch a new line that’s slightly on the expensive side, so don’t want to waste money sending your ads to everyone that follows your page. Instead, go down to the ‘pages’ search filter, and choose people who have connected with your company page. On average, people who’ve bought from your business before are more likely to purchase goods &/or services from you again. Once you’ve got your company page audience up, click the “page likes” tab on the top, then click “advanced” and “financial”. You can now choose what salary level and location you’d like to target. Don’t waste money sending ads for a luxury car to students halfway across the state! Pro tip: If you have a small page audience, or use lots of filters, you may find a little blue “I” icon pops up. This is just letting you know there aren’t enough users in your target group to generate the graphs. You can still send ads to these people (but you might be wise to go back and start your search again). If your Facebook Business page is relatively new, you can still use the same search feature! We’d just recommend using the search filters to examine everyone on Facebook. Go down to the Pages tab of the search pane and remove your company page if attached. Now you’re free to explore people by city, country and more! If you find a group of people that look like they’d be interested in your services, make sure to hit save on the navigation panel up the top of your screen. 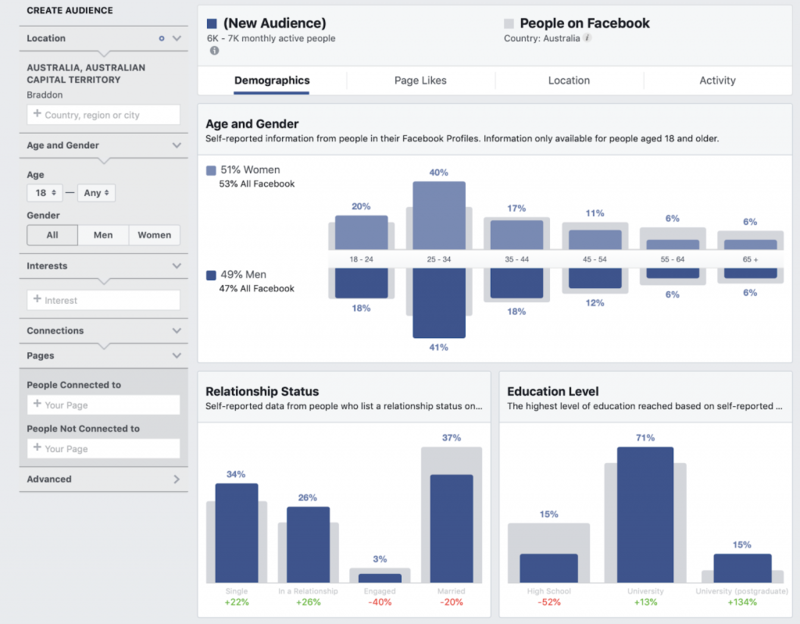 Facebook Pixel: find out where your sales are coming from (& then get more). Once you’ve decided on the group you’d like to target, it’s great to have some way of measuring your campaign’s impact. Running an ad campaign across a few different platforms at once, and not sure where your sales are coming from? Facebook offers a handy free tracking tool called the Facebook pixel that can help you out. Once installed in your website’s code, the Facebook pixel will keep an eye on your website visitors. If people visit your site and take an action (like buying a product), Facebook will check their details and let you see if they came to your site after seeing your Facebook ad. This is a great way to tell whether your social media campaign is driving more sales (or if it’s just a coincidence & you need to get back to the drawing board). Facebook’s pixel will also store the details of people who buy things from you after seeing ads on Facebook in Custom Audience groups. This allows you to send them targeted ads in future and build a dedicated client database. Sounds like something you’d be interested in? If you’d like some help installing this tool, flick us an email and we’ll give you a hand. Facebook is an incredibly valuable marketing tool, used right. We hope you enjoy these insights and get better bang for your buck using them! If you’d like to discover more tips and tricks to make Facebook work harder for you, feel free to get in touch. With everything from training seminars to full account management, we’ve got the support option to suit you. Next Post : How is AI revolutionising the future of digital marketing?